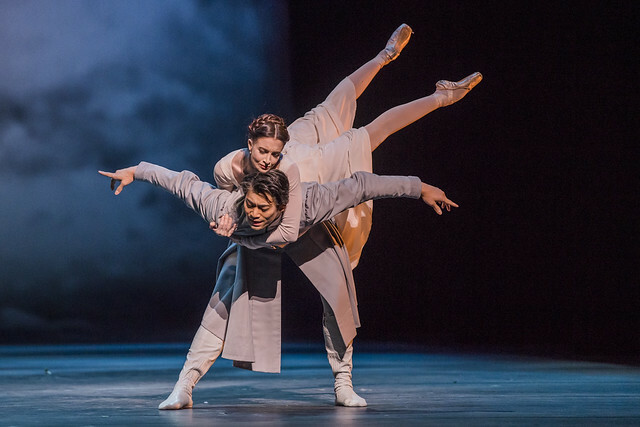 Ryoichi Hirano as Leontes and Lauren Cuthbertson as Hermione in The Winter's Tale, The Royal Ballet. © 2018, ROH. Photographed by Tristram Kenton. Love, jealousy, loss and reconciliation drive this adaptation of Shakespeare's play. Christopher Wheeldon and the creative team behind Alice's Adventures in Wonderland translate the complex plot into a vivid ballet, with a specially-commissioned score and six principal roles that show off The Royal Ballet's exceptional talent. Two Kings, once childhood friends, are reunited when Polixenes, King of Bohemia visits the court of Leontes, King of Sicilia. Leontes lives in blissful happiness with his wife Queen Hermione and their son. Polixenes leaves after staying for nine months, by which time Hermione is heavily pregnant. Leontes is thrown into an agony of suspicion: could his wife and his oldest friend have betrayed him? When the child is born Leontes orders that it be abandoned in a remote place. Antigonus, the husband of Hermione's friend Paulina, takes the baby away to the shores of Bohemia, where he is pursued to his death by a bear. The baby girl is discovered by a shepherd, given the name Perdita and raised as a member of the shepherd's family. In a twist of fate, Prince Florizel, King Polixenes' son, falls in love with Perdita. Polixenes is not happy that his son loves a shepherd's daughter, so the two lovers flee to Sicilia to find protection in Leontes's court, where Perdita's true identity is revealed. 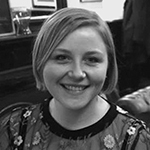 Shakespeare's plays have provided inspiration for choreographers for over 250 years, from Marius Petipa in the nineteenth century to George Balanchine in the twentieth and Royal Ballet heritage choreographers Frederick Ashton and Kenneth MacMillan. The Royal Ballet has a strong tradition of compelling storytelling in dramatic ballets, and when it comes to adapting Shakespeare, both Ashton (The Dream) and MacMillan (Romeo and Juliet) created lasting Company classics. Shakespeare's The Winter's Tale has an unusual combination of dark drama and comedy, as well as an expansive timespan and complex plot. This means it is performed less frequently than some other Shakespeare plays. Many know the play more for its famous stage direction, 'exit, pursued by a bear', than for anything else. Christopher Wheeldon's The Winter's Tale is the first ballet inspired by the play – in fact it is the first full three-act ballet based on Shakespeare to be made on The Royal Ballet in over 50 years. This production reunites the creative team behind Alice's Adventures in Wonderland, with designs by Bob Crowley and music by Joby Talbot. Crowley's designs for The Winter's Tale vividly depict the contrasting worlds explored in the ballet. Dreary, black costumes in the Sicilian court contrast vibrant sets and costumes in the light-filled, pastoral Bohemia. Wheeldon streamlined the plot to focus on the main characters, with the driving force of the narrative coming from Leontes's unfounded jealousy against his wife and friend. This mood contrasts the joyful love between Perdita and Florizel. The ballet has six principal roles, providing exciting opportunities to show off the talents of principal dancers, as well as a host of smaller roles and large ensembles that showcase the full Company at its best. Wheeldon's choreography is inspired by the lyricism of Shakespeare's poetry. 'I've always wanted to make a Shakespeare ballet', he says, 'and I think the biggest challenge for any choreographer tackling Shakespeare is to find a way to infuse that poetry into the movement and not just use the plot line'. He has streamlined the plot to focus on the main characters and themes, saying 'it's those moments of high drama that work very well for dance'. 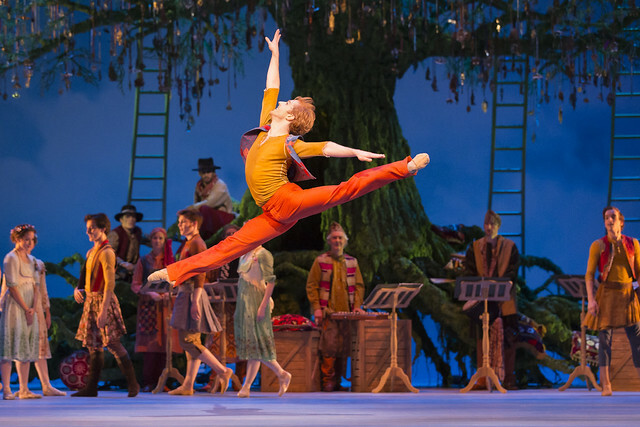 Christopher Wheeldon worked closely with composer Joby Talbot to conceive the scenario for The Winter's Tale. With each of the three acts requiring a very different sound world, and an onstage band, Talbot created a bespoke score that is integral to the story and the movement. Act I sounds taut and troubled, with strangulated brass and muted trumpets evoking the murky, unsettled Sicilian court. Act II is full of colour and joy, with shimmering musical textures that complement the bright set. In the final act, the music becomes more free as the drama reaches its conclusion. If you liked The Winter's Tale, why not try…. The Winter’s Tale runs until 21 March 2018. Tickets are still available. The Winter's Tale will be relayed live to cinemas around the world on 28 February 2018. Sad not going to see this live, as I loved Alice's Adventures in Wonderland..but hopefully it will be on the cinema when I am in Dublin next month.